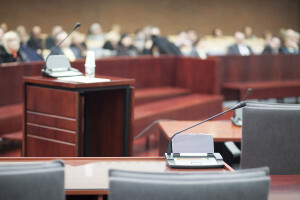 All about indictment: In the previous blog post, I explained what a grand jury is. This post, an extension of the first, focuses on the indictment–the result of the grand jury’s decision. Generally used in the criminal trial process, an indictment is the formal charge(s) brought against the accused, typically in a felony case. In order for an indictment to be rendered, the prosecutor must present evidence to the grand jury such that the grand jury is able to assess whether charges should be brought against the accused. It is very important to understand that the mere fact an indictment is rendered does not mean that an accused will be found guilty; nor does it mean that an accused will ultimately be convicted for the charges on the indictment. (This is where things get a little more complicated and lawyering comes into play, but we’ll explore this more in future posts.) The main point is that an indictment is simply a formal announcement, for lack of a better word, of the charge(s) the prosecutor anticipates pursuing against an accused, and it should set out the offense with enough specificity that an accused may prepare his defense.